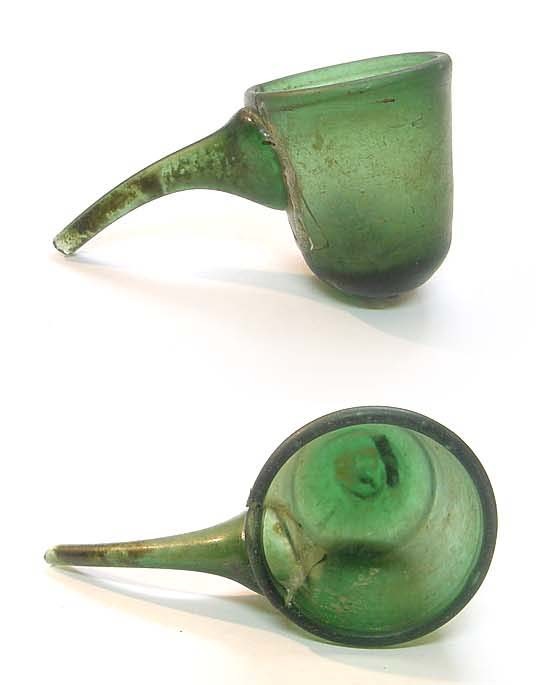 A Persian moulded green glass vessel with pipette extension, used in the medical procedure of bloodletting. The cupping glass was used to create suction and draw blood to the surface of the skin; the cup would then be removed and then the physician would make the incision. Pipe rejoined to body; loss on extremity of pipe; otherwise intact; length of pipe 47 mm / height of bowl 47 mm / diameter at rim 41 mm. For a similar example see Glass from Islamic Lands: the Al-Sabah Collection, Kuwait National Museum, p 145."